From Software are back again with their infamous series of action RPGs with Dark Souls 3 on the PS4. Does the flame still burn or has darkness fallen upon the franchise? 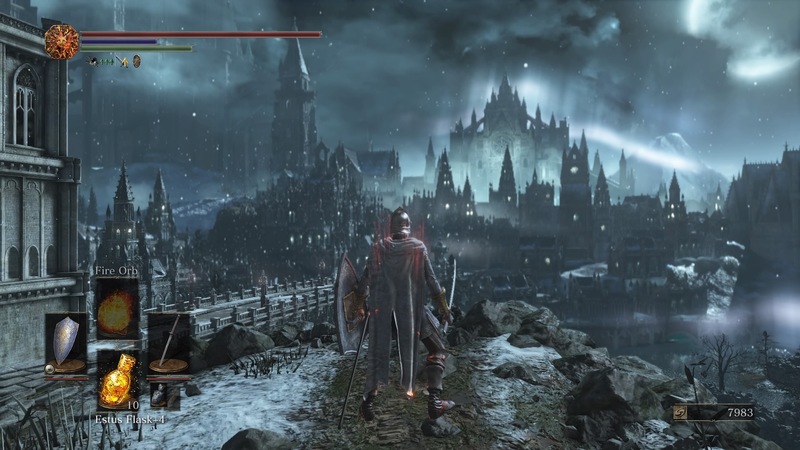 Based around a world of European knights, gods and demons, Dark Souls 3 doesn’t stray too far from the mould of previous entries in the series. For the uninitiated Demon’s Souls was released on the PS3 as an exclusive in Japan in 2009, Dark Souls was a multiplatform release in 2011, Dark Souls 2 in 2014 and now we have Dark Souls 3. There has also been a re-release of Dark Souls 2 and Bloodborne was released last year which although a separate IP shares a lot of the same DNA. That’s a fair few games in a relatively short period of time. The thing is the gameplay is so tight that you can afford to have similar games in such quick succession, just ask a Call of Duty fan. Minor changes have been made to the formula and the sword play in general is quicker paced (thanks to what From Software learned from Bloodborne, no doubt) but if you’ve played a decent amount of one of these games before then you’ll pick it back up straight away. Your attacks are on R1 and R2, blocking is on L1, whilst L2 parries. Depending on what equipment you’re rocking that might not be strictly true but this is the basic set up. This leaves both thumbs available for movement and controlling the camera, with the face buttons used to dodge, use items, interact with things and switch between holding your weapon in one or two hands. There is also a new weapon art where holding L2 whilst two handing a weapon puts your character in a stance that allows you to pull of special attacks that’ll give you an advantage in certain situations. This could be a shield break or a lunging attack or something else, the options you have depend on the weapon you’re using. Using these uses your FP which is also used for spells. New to this game is also an Ashen Estus Flask. The normal Estus restores your health, the Ashen Estus restores your FP. You have a maximum amount of Estus Flasks (which get restored when you rest at bonfires, natch) which you can then choose to split between the two types. I personally went full on melee so didn’t bother with the Ashen Estus, but a full blown magic user might be less up close and personal so would want to restore their magic more often. You can lock onto enemies and then it’s a matter of watching their movements, looking for tells, weaknesses, anything that allows you to get an attack in without getting hit yourself. As with previous titles if you’re too gung-ho you will get wrecked very quickly and indeed the intro to Dark Souls 3 surprised me in how willing it was to hurt you. In previous games the tutorial area enemies have basically been dummies for you to wail on whilst learning the controls but the first thing the first enemy did here was to do a leaping attack at me, before the game had even told me how to block (I knew how but a newer played might not be so impressed). The first boss also has a surprise or two up his sleeve, but that’s what the Souls games have always been about. As always dying isn’t really a problem though. You get put back to the last bonfire (checkpoint) you rested at so you have to work your way back through enemies you’ve already killed again but if you’ve done it before, you can do it again. You don’t lose any items you’ve picked up but you do drop all your souls, your currency for levelling up, buying items, everything. You have a chance to get your dropped souls back if you return to the place you died but if you die before retrieving them then they’re gone forever. It might sound harsh but losing a bundle of souls is a liberating experience and there’s always more souls where they came from. If you quit at the first sign of trouble then you’ll be missing out, but if you have the tenacity to overcome that obstacle then you’re hooked. That obstacle could be a boss, a group of enemies, maybe you can see an item in the distance and you just want to reach it. Dark Souls 3 is full of these hurdles and your experience with the franchise will colour your trials. There is a learning curve to these games that a lot of players will have already been through, others have a difficult yet rewarding time ahead of them, at least initially. There is co-op play where you can summon help from other players who offer it if you so desire but this in turn opens you up to invading players who just want you dead. As with most things Souls it’s not straight forward but the help is there if you need it and jolly co-operation is a lot of fun. It’s not all about the combat however. There is a strong exploration aspect to these games that is still present here. Sure you’ll be fighting enemies as you explore but looking for items, hidden secrets, shortcuts and the like is the fuel that keeps you battling. Defeating a boss and opening the huge doors (they’re always huge) to reveal the sunlight shining through onto a gorgeous wooded area is something no other game has matched and it looks stunning on the PS4. The details on your armour and the artwork of the environments is so strong that you will find yourself just stopping to admire the scenery. Unfortunately the PS4 has trouble keeping a steady framerate at all times. Nothing too game breaking but there are little stutters here and there that are quite noticeable. Load times however are surprisingly quick off the back of Bloodborne, though they’re far from instantaneous. If you are a returning player then there is no question that this is an excellent entry in a series you enjoy and it’ll last you about the same as other games in the series (took me about thirty hours to complete my first playthrough). How you feel about the references to previous games will be up to you. There are little nods here and there, massive nods elsewhere and sometimes they’re not even nods, the thing you know is just there in the game. Some may call it laziness, some pandering, others may appreciate the attempt to try and pull everything together. That’s only something you can decide. I, personally, am fine with it and have to admit to getting feelings of nostalgia at times, which may be what the designers intended and if so it worked on me. Despite their success there’s still little out there like the Souls games and although Dark Souls 3 might not feel as original or mind blowing as the earlier titles it still has that magic that makes me wonder if a newcomer to the series could feel the same way as I did about the first Dark Souls starting here. If you have the means I’d say start at the beginning, but if you just want to skip to this one then I expect your journey will be slightly different to mine, but it’ll be an epic journey all the same. Prepare to die yet again. The formula might not change but there's not a lot out there that matches Dark Soul's quality despite how many try. The references to the previous games might grate but new and old players will find another epic adventure to embark upon.